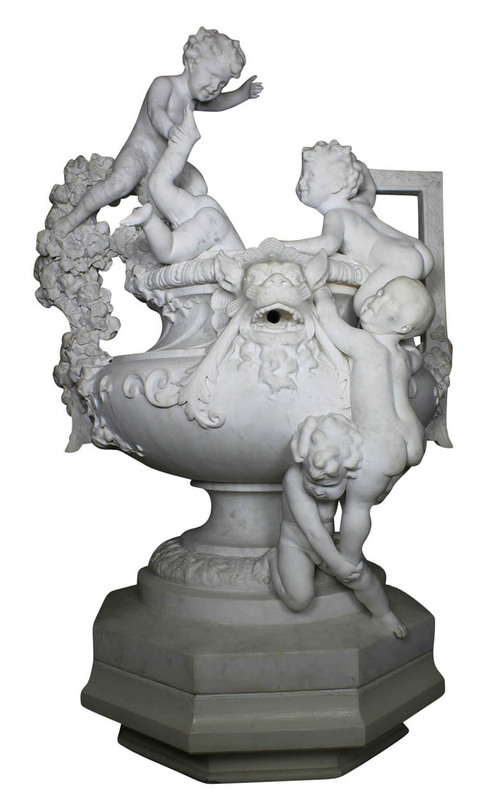 A Very Fine Large, Rare and Charming French 19th Century - Belle Epoque Carved White Marble Whimsical Figural Urn Fountain Depicting Children Climbing on an Urn with Flowers and Garlands, influenced in the Louis XV style, By Joseph Reynés I Gurgui (Barcelona, 1850-1926). Signed: Reynes. Circa: Barcelona, 1890. Notable mention: An almost identical Carrara marble fountain also by Josep Reynés carved in 1893 currently at the Parc de la Ciutadella, Barcelona, Spain. Joseph Reynes Gurguí (Barcelona, 1850 - 1926) was a Catalan sculptor, also known as Reynesy-Gurgui, Spanish school. He studied at the Ecole de la Llotja, studied for a time in Paris, in the workshops of the great French sculptors Jean-Baptiste Carpeaux (1827-1875) and Carrier-Belleuse (1824-1887). He devoted himself mainly to interior decoration. His works were profoundly marked by a French influence. He exhibited in Paris in 1895 where he received an honorable mention. In 1890 he obtained the first medal in Madrid for "The Violinist". A Very Fine Large, Rare and Charming French 19th Century - Belle Epoque Carved White Marble Whimsical Figural Urn Fountain Depicting Children Climbing on an Urn with Flowers and Garlands, influenced in the Louis XV style, By Joseph Reynés I Gurgui (Barcelona, 1850-1926). Signed: Reynes. Circa: Barcelona, 1890.
Notable mention: An almost identical Carrara marble fountain also by Josep Reynés carved in 1893 currently at the Parc de la Ciutadella, Barcelona, Spain. Joseph Reynes Gurguí (Barcelona, 1850 - 1926) was a Catalan sculptor, also known as Reynesy-Gurgui, Spanish school. He studied at the Ecole de la Llotja, studied for a time in Paris, in the workshops of the great French sculptors Jean-Baptiste Carpeaux (1827-1875) and Carrier-Belleuse (1824-1887). He devoted himself mainly to interior decoration. His works were profoundly marked by a French influence. He exhibited in Paris in 1895 where he received an honorable mention. In 1890 he obtained the first medal in Madrid for "The Violinist". E. Benezit Dictionaire des Peintres, Sculpteurs, Dessinateurs et Graveurs by Grund - Nouvelle Edition, 1976 - Volume 8, Page 714. Cristina Mensoza, Ramon Casas, Retrats al carbó, Sabadell, Editorial AUSA, 1995, 282 pp. 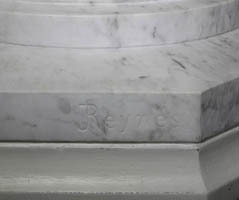 Please note: The marble urn is attached to an hexagonal painted cement base which was removed together as it was displayed for use as a fountain.